I’m an advocate of using real world tools in school. After all, if we’re not using tools of the world in our classrooms, then what world are we really preparing students for? The one that is most convenient... or the one that is right for kids? If you want to do what is most convenient, then you can work at a school where they ban, block, filter and restrict. You know those schools. Some kids' heads are on their desks, others are facing forward listening (but are they really? ), and others are engaged in the outdated skill of taking down the words their almighty teacher says or writes on the board. Paper, pencils, pens, outdated textbooks are plentiful. In schools where we’re doing what is right for kids, you see engaged youth who use the filter between their ears to determine how to best access information. Students are empowered rather than restricted from using personally owned digital devices in school. At these schools they understand that people, not tools, have behavior. Fortunately, more and more often these schools that mirror the real world are starting to crop up in places like New Canaan High School in Connecticut and The School in Harlem, New York. When I speak about schools such as these, I often get a lot of questions like this one I received recently from a Twitter follower. "Great ideas for Facebook, but would we be taking a social risk? Facebook is taboo for many admins and districts are frowning on FB because of the potential risk for unprofessional behaviorbit.ly/gCEp2n ." My reply to such inquiries is always the same. Tools have no intent. Facebook doesn’t cause a risk for unprofessional behavior, but it catches those who engage in such behaviors. What we’re really saying when we block and ban is that we don’t want to bother dealing with issues such as those who have chosen to publicly engaged in unprofessional behavior. It is much more convenient to turn heads the other way. "Would you encourage using a Facebook page or profile to connect with students? Is there a difference?" and use an unfiltered internetThere is not a one-size-fits all answer. It depends on your intent. If you are like me or Principal Chris Lehmann you have one profile because it’s just another way to communicate and you’ll communicate with your students in any way they wish. The idea of being two separate people may just be too hard to keep track of and you enjoy being a professional and social role model for students. If you are like librarian Michelle Loots (Luhtala) you use a personal page to connect with friends and family, a professional profile for students and a page to keep students in the know about library activities.. If you are like first grade teacher Erin Schoening you create a page as a window into your classroom to connect students with parents. If you are like Brooklyn Tech High School you use a page as a place to connect with present and past students and teachers. You might be like Education Land, a group created to connect those who are interested in education. If you want to understand how you can maintain a professional presence on the site separate from your personal profile, here are some tips, directly from Facebook’s Safety for Educators page (note: You may also want to visit the "Teachers" page in the Facebook Safety Center.) First they suggest that if you are a teacher and have a personal profile, you can consider creating a group or a Page specifically for interacting with students, parents, or colleagues. CreateFriend Lists to control what parts of your profile students are able to access. If you don’t get the difference between pages, and groups, and friend’s lists here is how it’s explained on Facebook’s Safety for Educators page. Pages are for broadcasting great information to people on Facebook. For example, you could create a Page called "Ms. Smith’s 9th Grade Science Class" where you post daily homework assignments. Anyone can become a fan of a Page on Facebook. People who choose to become a fan of a Page will see updates on their profile. To create a Page, clickhere. Pages are free, you can control them with your personal profile, and they keep your profile separate from your students. Groups make it easy for members of a community to connect, share and even collaborate on a given topic or idea. For example, you could create a group called "American Literature 101 Discussions" where you and your students can contribute to group discussions. Or you could create a group for all of the educators in your your department to collaborate on lesson plans and share ideas. To create a group, click here. Friend Lists provide organized groupings of your friends on Facebook. For example, you can create a Friend List specifically for your students. Then you can control which parts of your profile are visible to this entire list. You can also filter your view of each list’s stream of activity separately on the home page, or send messages and invites to this group of people all at once. To learn more about creating and managing Friend Lists, click here. If you want to connect with other educators who are using Facebook for Learning, join the Facebook in Education page. This page is a resource for teachers, professors, administrators, counselors and others who work in education. You can refer to this page for privacy tips to help you maintain both a personal and a professional presence on Facebook. You'll also find answers to common questions including how to report abuse to Facebook and the best way to use Facebook as a communication tool in your school. To become a fan of this page, click here and choose the "Become a Fan" option at the top of the page. 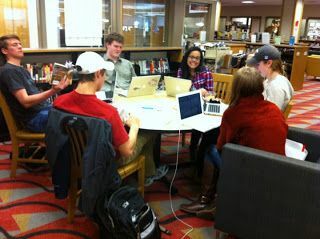 Read Librarian Michelle Luhtala's response to this blog post at Y U Need 2 "Friend" ur Students! Lisa Nielsen is best known as creator of The Innovative Educator blog http://theinnovativeeducator.blogspot.com and Transforming Education for the 21st Century http://ted21c.ning.com learning network. Lisa is an outspoken and passionate advocate of innovative education. She is frequently covered by local and national media for her views on "Thinking Outside the Ban" and determining ways to harness the power of technology for instruction and providing a voice to educators and students. Based in New York City, Ms. Nielsen has worked for more than a decade in various capacities helping schools and districts to educate in innovative ways that will prepare students for 21st century success. Her first book “Teaching Generation Text” is set for a fall 2011 release. You can follow her on Twitter @InnovativeEdu.